Vodafone Essar, a pan-India GSM Mobile Service operator with a subscriber base of over 124 million, has come up with an innovative way to connect to your family and friends anywhere in the World on Facebook without GPRS or Internet, through the new Facebook Voice Updates service from Mobile. 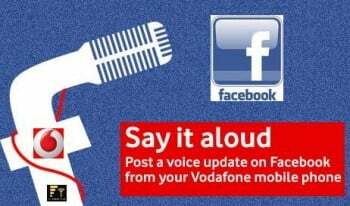 Facebook Voice Updates on Vodafone lets people connect to their family and friends on Facebook in their own voice, even without Internet/ GPRS/ 3G access on their mobile phones, which makes it an easy access for a large audience anytime anywhere. How it works ? : The product is easy-to-use – for example, to broadcast what you’re up to today, simply dial a short code 51010 to Record your voice message, and post it as your status update on Facebook. Your friends will then receive an SMS alert about your new status update, to which they can reply with their own voice updates on Vodafone. The charges will be Rs.3 per minute. Few days back the Voice Update service was launched on Aircel. Does any body knows when Vodafone is going to launch 3G services in Bangalore ?